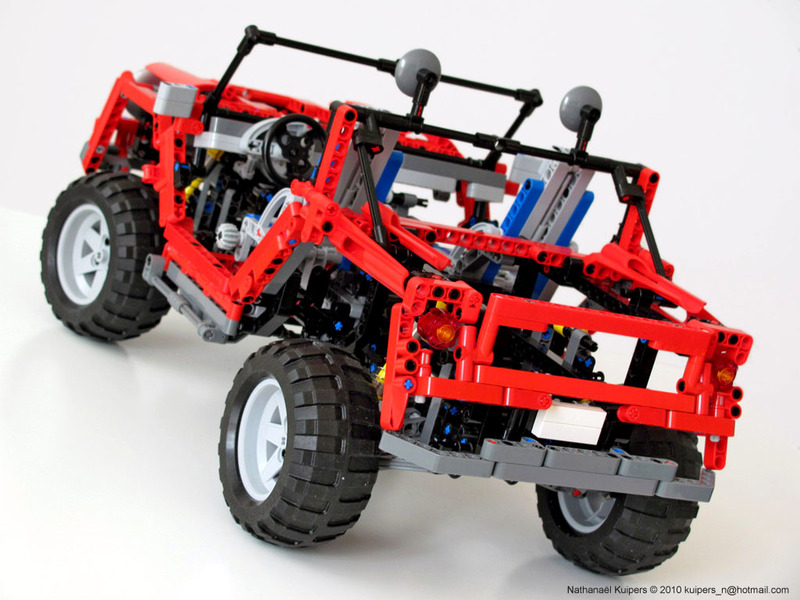 Former LEGO Designer Nathanaël Kuipers who developed 8674, 8271, 8292 LEGO official Technic sets and shown us about two years ago his Technic Concept Car . Since the beginning he developed the concept around modularity requirements and interchangeable functional blocks (unibody frame, front and rear suspensions; gearbox; engine - front or rear mont; front, rear, or AWD, etc...). Such concept once achieved in its individual modules, opens endless possibilities. Simply genial and gorgeous! The original Concept Car, was not a concept in its own, but Nathanaël has meanwhile proven why he called it modular and produced another car based on the same concept. Concept 4x4 is a Jeep based on some of the same modules (V12 engine and 5+R speed gearbox), a few other compatible ones made new (suspension with higher ground clearance; off-road tires; 4WD with center diff; adjustable seats, etc...) and an almost unchanged frame. An example from how much variation can be introduced on the same platform and how flexible the concept is. Enjoy the photos and find more info at MOCpages or Nathanaël's Brickshelf gallery! See how the several modules just fit and snap together. This another great example where nothing is missed and what it takes to become a real Technic car Super! 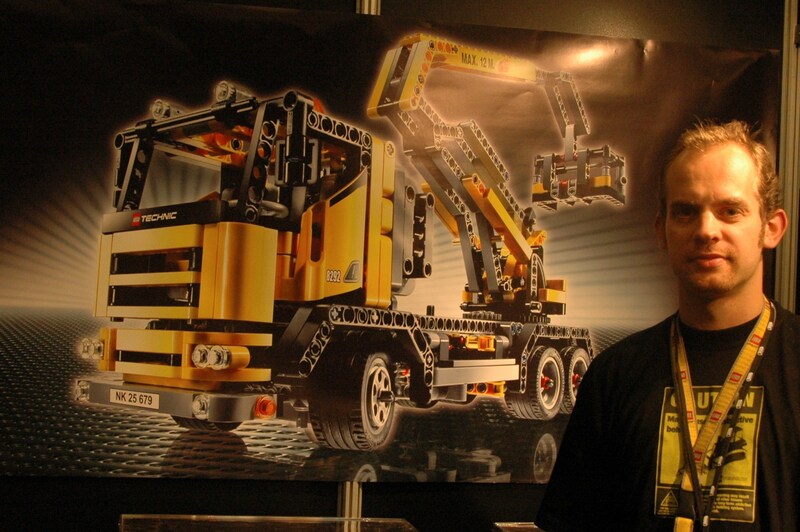 Last but not the least and because it is always good to have a face to put on a name, just look at this photo from Nathanaël, standing in front of one of his LEGO official designs (8292, Cherry Picker). This guy should still be at TLG playing with our future toys, don't you agree? "...we must distinguish among so called Super Cars..." - do you mean 8070? "Supercar is a term used most often to describe an ultra-high-end "exotic" automobile, whose performance is superior to that of its contemporaries. It has been defined specifically as "a very expensive, fast or powerful car"." According to this definition, 8070 is a supercar; this Concept 4x4 is not. 8880 wasn't really a supercar either. If we want a car with features like a transmission gearbox, brakes, 4wd, 4-wheel-steering and suspension, we should stop asking for 'Super Cars', and just ask for a 'car'! That way TLG might make it less 'exotic' and more realistic (ie, no motorized doors). One thing that I see alot is this use of Difs in a 4x4. Not just in the axles but a center as well. The issue is a Lego dif puts power to the wheel with the least traction is. Anyone that knows about off roading in RL knows this is a ticket to get stuck. This will make your Lego 4x4 get stuck as well. Tip if you want a rock crawling/off roader,no difs soild axles. Also the Ujoints in technic are a wesk Link they break so easy. I just say, it's time for a movie of this nice car ( and it's different modules )! Will you be with me that the Concept 4x4 and Concept Car should be official sets? I think we should submit his designs to LEGO CUUSOO!!! interestingly I was also looking at that Wikipedia definition sometime ago. From a certain perspective I agree with your interpretation, but we are discussing in a gray area. At one hand 8070 look and shape may resemble a Supercar, but electric functions like opening doors and hood may represent any car, and not of any relevance into a Supercar model. Otherwise V12 engines, working suspensions and AWD drive functions maybe also characteristics from a Supercar. What I think the old school fans have been waiting for, is a so called Supercar in the same sense as LEGO called them in the past. One way or another, many will be happy with 8070 and more if they were yet available. yes you're right about the problems with diffs, on Off-Road models. 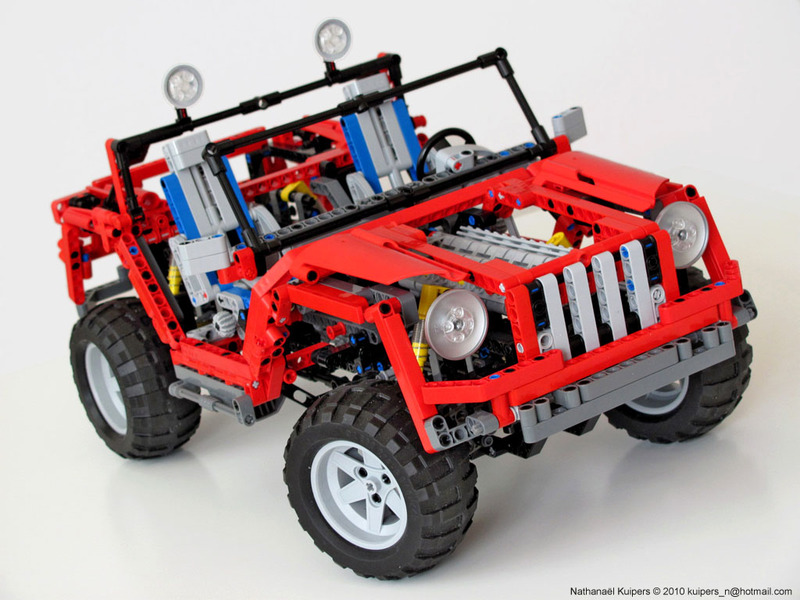 However they are used in LEGO 4x4 models to state a certain level of realism and technical expertize. Off-course real Off-Roaders, have these and much more, like Torsen or limited slip diffs. These are possible to realize with LEGO elements, but usually don't fit the scale we use to see in these models. A good compromise is a manual switch to lock diffs when needed, if the previous LEGO Technic diff model is in use. "This guy should still be at TLG playing with our future toys, don't you agree?" I gotta be honest with you guys and say no, I don't agree, at least not soley on what I have seen from him so far. The cherry picker was great, no doubt about that. But that's only one model. These concepts don't offer anything new that we haven't already seen before like most of the previous cars (the auto chassis, the test car, the daytona vx4, the superstreet sensation). Don't get me wrong, these concepts are great MOCs, but they don't have the looks, the polish or the innovation that an official set like this (assuming it's a flagship supercar) should have. So, whilst his MOCs are great, to say Lego should release these as sets, or that he is the best technic designer out there is too much. In my case, the Cherry Picker never was among my favorites. The F1 Ferrari however is a masterpiece. Such clean and awesome design could only come available from a truly gifted designer. I like the concept car design (more than the 4x4 off-roader), despite it somehow resembles the 8448. But its true innovation comes not from the good design and details, but from the concept, modularity and versatility. Indeed it is similar to the 8448, which also had modularity and versatility. It's chassis, engine, gearbox and axles were all modular, each individually packeged in their own little boxes. The bodywork could be rebuilt into a gull wing, a soft top, a hot rod and so on. But yes, versatility of opinion makes the human race a much more interesting one. I have lost all respect for the Lego company. The community vote foe the Technic challenge is on their way. How is it that Zbj1987 has four entries into the final vote, Allthetehcnincmaniac has two entries, and mhq also has two. How is that fair to other people? If Zbj1987 has more entries then it's likely to be because he built more models to a higher standard, earning him those enteries. If you designed and submitted as many great models as he did you might also have had 4 enteries. The rules are the same for everyone. That seems fair to me. Al, You're crazy. 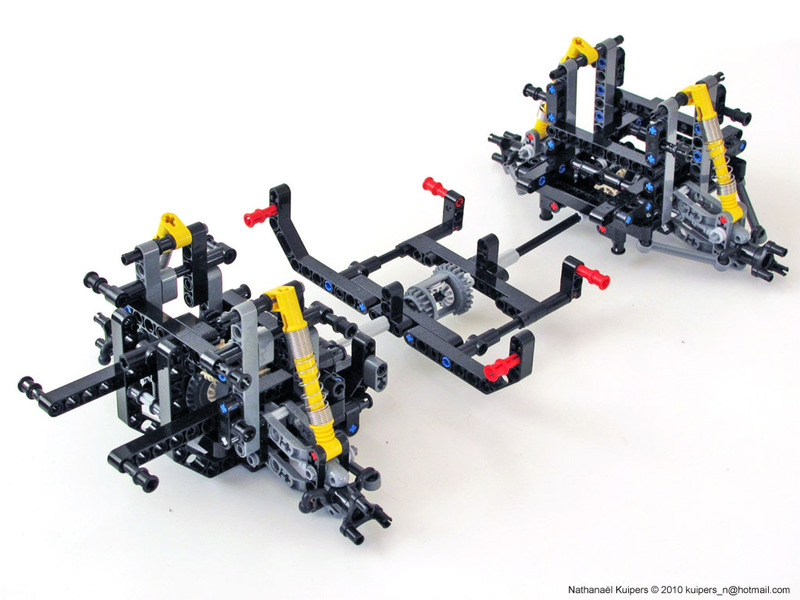 What are the current technic designers at Lego bringing out that is so revoluntionary? Nathanael is the best example of a pure technic buider who is not currently employed by TLC. So the new 8070 supercar blows away what Nathanael has accomplished with his latest models? I think not. The technic designers at Lego do not get to choose which of their models are sold as official sets. 8070 was probably chosen as a result of tests done with kids in the target age group. I think transmission, steering and 4wd (if appropriate) should be thought of as standard, not revolutionary features. 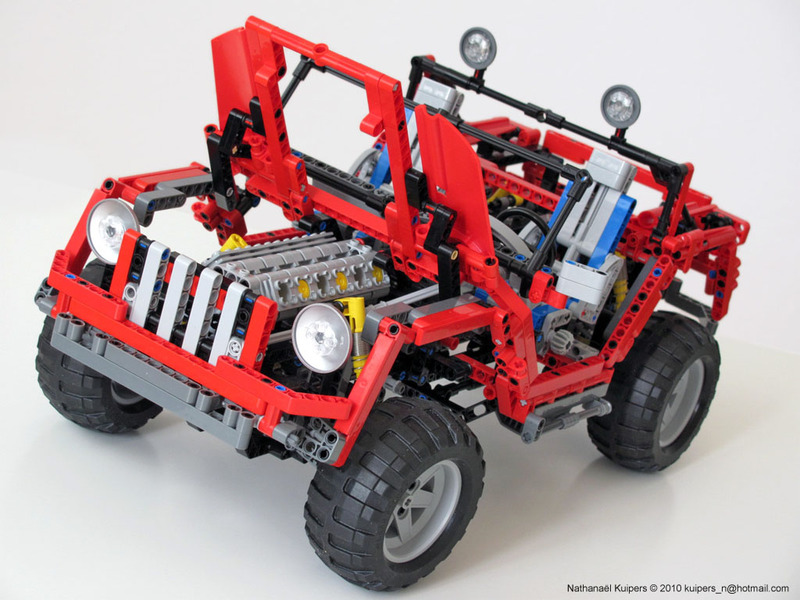 This 'concept 4x4' has nothing special, other than using very good 'official' Lego building techniques. There are many features found in real off-road vehicles (diff-locks, extra multiplying gearbox, V4 engine) which are not in this Concept 4x4. edit: I meant V8 engine, not V4. If you look at title I gave to this post, you will see that I didn't mentioned nothing like 'revolutionary' but 'evolutionary' ("evolves"). There is a difference. It is great to see builders using building techniques and developing clean designs, like TLG designers would probably do. Regarding "revolutionary", this is something unfortunately almost accessible only to TLG Designers, since they are those who can decide to develop and use introduce new parts into use. So we must put things in perspective, when looking to them and asking for more. What I mean is that our expectations towards TLG Designers and AFOLs, should be put at different levels. Calling Nathanael's models "Nothing Special" is pure crazy talk. Just because he doesn't decide to add a bunch of flimsy gadgets and mechanisms that could "Overkill" what is already an excellent design. He did throw in the adjustable seats in this new model, that hasn't been done since what, 1988? A nice little nostalgic touch that may be overlooked for some silly parking brake feature. I don't see anyone else turning out incredible models with the same master building style that Nathanael does. 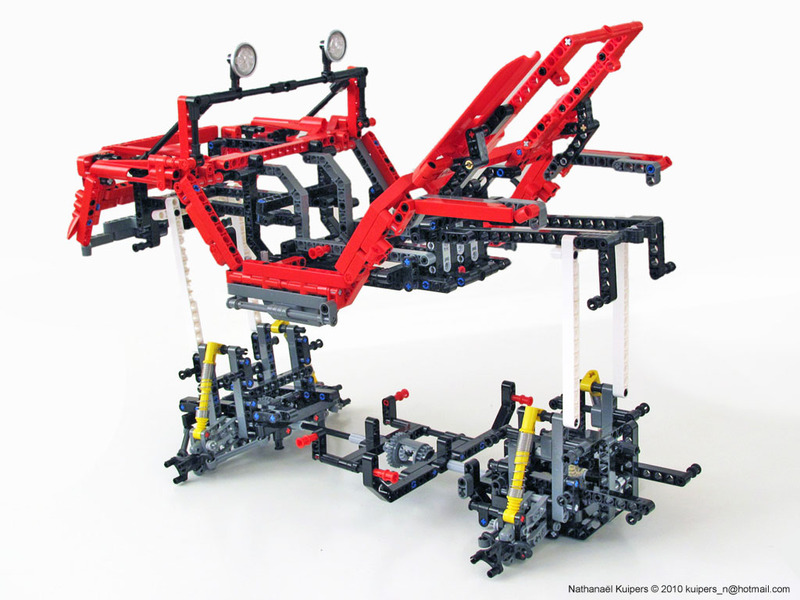 It is refreshing to see positive comments being made by one of the top builders in technic. I fully agree that Industrial Designer's creations are magnificent and truly market worthy. However, They would need to be updated with current elements like the new panels and such. I'm not saying he isn't a great designer, he does some good stuff for sure, i'm just saying that, based only on what I have seen SO FAR, I would not call him the best designer or automatically worthy of a job as a designer at TLG. Nathanael already was a designer for TLG, so obviously he was already worthy. I agree. Calling Nathanael's models 'nothing special' is pure crazy talk. What I actually said was that this particular model has 'nothing special, other than using very good 'official' building techniques'. This was not even a negative comment, so you didn't have to turn it into one. Every designer at TLG has to gradually pick up the 'official' way of building. No matter how much better Nathanael's building style is, I wouldn't say the current Technic designers are 'lacking' good building technique, nor are they lacking innovation. I was quoting Mark V, not the post title. Danial, I think the fact that the overal design is so good that it compensates for the fact that there isn't a half a dozen other features. It's not like this is a re-hash of some original model that had been previously released by Lego. I'll take a great looking model with average features over something that looks like crap that moves something around in circles. How many official Lego sets actually have something special that are not using the power functions? I would love to have either this concept 4 x 4 or the concept car. Ok, we all agree that his MOCs are great. We only seem to disagree on exactly how great am I right? Well I guess that's just different opinions for you 8^). Is this MOC great? Yes. Is this MOC along with his original concept car alone good enough that "This guy should still be at TLG playing with our future toys"? Is this MOC good enough that "Concept 4x4 and Concept Car should be official sets?" I personally think not, but that's just me. To be fair tho, i've had a feeling that TLG has not been using the current assortment of parts to their full potential. Sure this guy can design models as good as anything in this years current technic offerings from TLG, but that's not what they really need, they need someone better or a new direction if they really want to reach that potential. Having said that, i'm only going on what i'm seeing here and the cherry picker, maybe he is capable of better, maybe he has more potential, I just haven't seen it yet. That's all i'm sayin really. I can see your point of view for Nathanaels's model as it only has a gearbox, full suspension, steering, and All Wheel Drive. And all of those things are to be expected in a "Super car" type of model, therefore they are nothing special. My point of view on this model is that Yes it has all of these features that should be there and not only are they done extremely well, but they are also done in studless design, which basically has been the NEW direction that Lego has been going in. To me, the entire concept is what makes it "Special" And the switch from studded to studless design is what makes it "Revolutionary" even if it is just the standard. Sure if it had a winch or working lights, or was even motorized, that might make it more interesting. What was the last model Lego had released that could be considered a "Super Car"? The 8466 Offroader from 2001? Right? That was the last one that had a transmission anyways and that was 9 years ago. There hasn't been a completely studless model that qualifies as a "Super car" released from lego yet, and in my opinion, Nathanael's design is not just a step in the right direction, but an entire stride. But to each his own. Everyone is entitled to their opinions.